GroupMe is a service, like competitor’s Beluga and Fast Society, that is improving on the concept of multi-recipient SMS. It allows you to establish, and store in your phone, any number of unique text numbers, and then affiliate those numbers with a dedicated group of recipient, like your BFFs or the “Super Bowl Party Planning Committee.” Then, when you send a message to that number, it is automatically and always sent to all other phone numbers linked to that unique group number. Additional features include picture messaging and instant conference calling (by actually dialling the number shared by the group) for those frequent occasions where tone is misinterpreted. 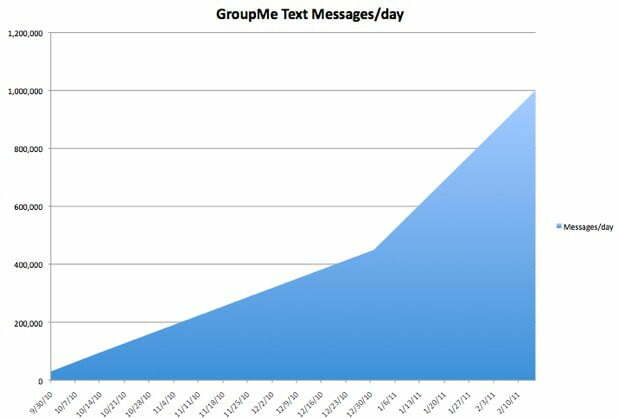 Like Twitter, GroupMe and others have focused on leveraging the ubiquity and accessibility of SMS to spread the use of their service, and with 1 million messages a day, they seem to be having some measure of success. However, for the growing crowd of smartphone and data plan users, a push-notification, app-based system seems much more efficient and appealing. Paying for messaging and data grows less desirable by the day, and while the SMS interface is dictated by your individual phone provider, application-based messaging gives the app creator and it’s users the opportunity for much greater customization. Either way, if you’re a wedding planner, this may be your new method of choice for updated the bride and groom simultaneously about the progress of their envelope etching. Remember people, stretch your thumbs; we don’t want to be known as the generation that took carpal tunnel to a whole new level.